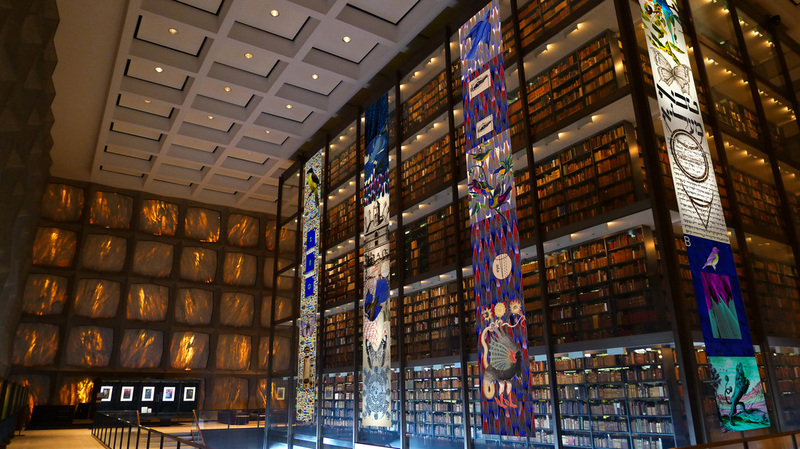 Moth Possible Yale installation was proposed for the Beinecke rare book library. Ten Art/NaturSci scrolls, approximately thirty-five feet in length, are to surround the library's stack tower. Schematic images were created from the library's Book of Secrets, Alchemy and Audubon collections. ​The concept for the project is based on proofs of Darwin's Theory of Evolution, especially Coevolutionary Aesthetic Theory, as developed by Yale's Prum Lab of Ornithology. Artists drawings are from Yale's Peabody Museum collections. Images of nanoscience of butterfly wings developed by Dr April Dinwiddie at the Max Planck Institute, Tuebingen. An exhibition to precede the installation was presented at the Institute Library with sponsorship from The Franke Program in Science and the Humanities, an initiative at Yale University that aims to foster communication, mutual understanding, collaborative research and teaching among diverse scientific and humanistic disciplines. For more on the exhibition, link to: bird architecture.